Each year this aromatic perennial from RF’s sunny herb garden grew to a height of six feet. In June and July umbels of YELLOW flowers appear at the top of the hollow stems. A most impressive plant. Bees love Lovage. The large yellow umbellifers act as landing pads & bees forage across the flowers taking in the nectar. If your garden has space enough in which to grow some Lovage, bees will find it. Ligustrum vulgare was deemed one of the wonder drugs of the day (1597) by John Gerard and used to treat jaundice, colic and fever in children. An alcoholic cordial, made from Lovage, sugar and brandy, was used to soothe stomach upsets. The plant has been made into a herbal remedy for sore throats as well as an aphrodisiac. Herbs were grown in Monastery gardens and used for dying, strewing, culinary and medicinal purposes. At Norton Priory Monastic Gardens in Cheshire, Europe’s most excavated monastic site, archaeologists have uncovered some 900 years of history. In the recreated herb garden, herbs are grown that monks would have used to treat diseases suffered by those living at the Priory. 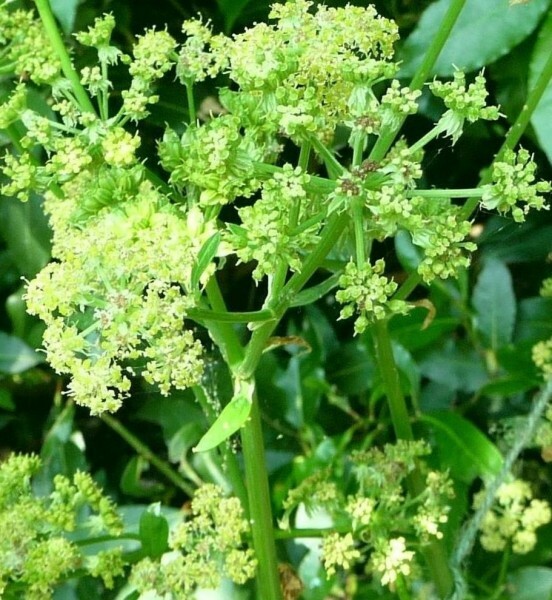 One malady, tuberculosis, was treated with coriander, garlic, elecampane – and lovage. The herb garden was made as part of the BBC’s ‘Hidden Gardens’ programme. The Norton Priory site is a haven for wildlife, and over a thousand different species have been recorded here. Monty Don, Herbal Remedies, The Telegraph, 2006. 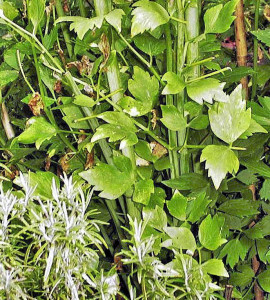 Lovage was used in cooking by the ancient Greeks and the Romans. Today Levisticum vulgare is a popular flavouring for potato dishes in Germany, and for tomato sauces in Italy. It was set down in a 9thC edict by Charlemagne as one of the culinary and medicinal herbs to be grown in every Imperial garden in his empire. ‘The flavour is like parsley and celery combined with a hint of aniseed and curry… So why aren’t we all using it by the handful and why is it virtually impossible to buy?… Today I’d like to redress the balance a bit. 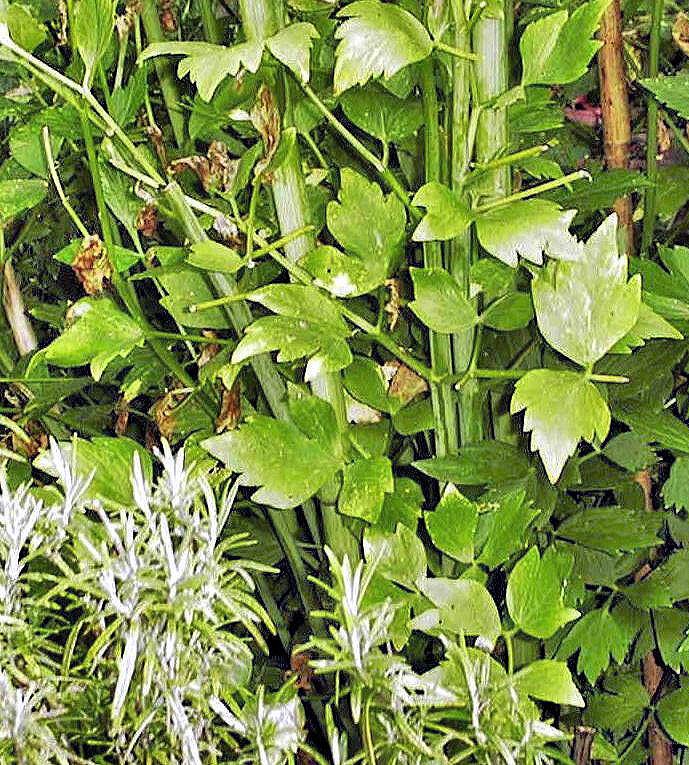 I want you to feel the lovage – give it a small corner of your garden, find it a place in your kitchen, and it might find a place in your heart…‘ Recipes: Lovage, Lettuce, Pea and Cucumber Soup & Courgette and Lovage Pasta. Other names: Ache de Montagne (French), Apio de Monte (Spanish), Badekraut (German), Bladder Seed, Celeri batard (French), Celery perpetual, Cornish Lovage, Echte liveche, Guljavitsa, Harilik, Krovavnik, Lavas, Leeskputk (Estonian), Lestyan (Hungarian), Leustean (Romanian); Levistiko (Greek), Libecek (Czech), Libbsticka (Swedish), Liebstockel (German), Ligustico (Italian), Liperi (Finnish), Listikka (Finnish), Liveche, Loevstikke (Danish), Lopstikke, Love Parsley, Loveache (Middle English), Lubbestok, Lekarski (Polish), Luststock, Lyubystok (Ukrainian), Maggi, Maggikraut, Maggiplant, Mankracht (Dutch), Mountain Celery (Italy), Mountain Hemlock, Sedano di Monte, Seseli, Skessujurt (Icelandic), Zorya (Russian).